Welcome to another Small Business update, this time with Gillian Linnell of the recently slightly renamed GGL Pet Services. Gillian’s original interview was published in February last year and what did she want to be doing by now? She said, “I would like to be selling the supplies to local people and pet sitting clients and to have a brand and reputation which is very well known and recognised in the local community. Eventually I would like to employ staff and have a warehouse full of pickers and packers. This is just one ambition – I have a handful of different directions which the company can take“. I am in a different place than I was when first interviewed, I still offer pet supplies but a more niche market now: my suppier is Puchi Petwear, and they specialise in designer pet wear for dogs and cats, as seen on TV and used by celebrities. I dont tend to push this side of the business so much these days, as the Pet Service side has become the main title, hence the company name change from GGL Pet Supplies to GGL Pet Services. Not a great deal has stayed the same, it’s all changed! I’m now Licensed by OMBC for home boarding dogs, I have a vast client database and dog walking takes up a lot of my day. I have teamed up with another company, Kanine Kampus Doggie Daycare (read their Small Business Chat here), and we work together every day: it has given me a fantastic USP and a premium package to offer my customers. You have to have a passion, a love and a will to succeed: if you have no self belief you will find it difficult to succeed. My advice would be: Positive thinking every day. Enjoy your work – if it’s not like playing a fun game every day where you wake up all excited and raring to go, then you could possibly be in the wrong job. Get the right job, it’s never too late to change. Wherever it takes me, I enjoy my work and my life, and wherever I go, I know I will be happy and that I will always make the right choices. I have another project which I am currently working on to do with advertising/marketing Pet Businesses, so we will have to wait and see what happens in the future. Well, there’s a positive note to end on, and some good cheerleading for anyone considering changing their job to have a happier lifestyle! I look forward to hearing what happens over the next year! Visit GGL Pet Services online at www.gglpetsupplies.com. Note: Although I understand that GGL Pet Services is still going strong as of July 2014, Gillian is no longer taking part in the interview series. We wish her all the best for the future! 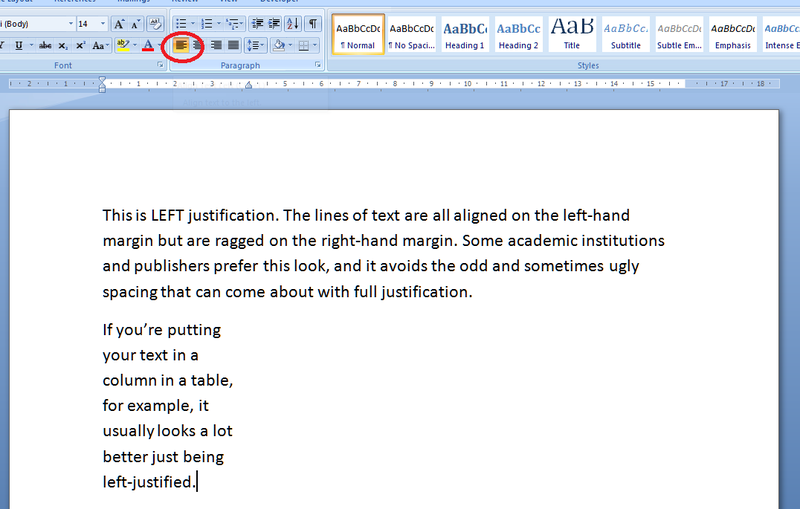 Today we’re going to learn about the different kinds of justification that you can use in Word documents, and why we would choose to use the particular options. Justification is the way in which your text is set out on the page. A margin is justified if all of the words on that margin are aligned vertically. For example, this article uses left justification: all of the lines of text start in the same place on the left, unless I manually indent them using tab or bullet points, and all of the ends of the lines present a ragged appearance on the right. How do I set the justification in my Word document? You can see four little buttons, in order from left to right: left justification, centre justification, right justification, full justification. 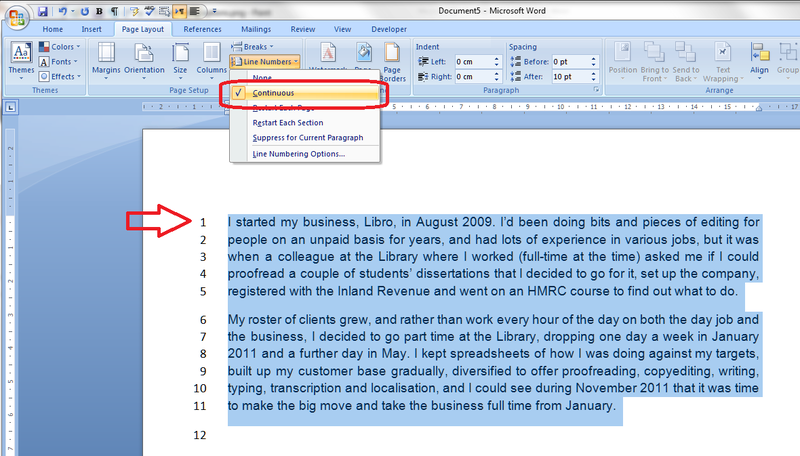 To set the justification for text that you have already typed, highlight the text and press the appropriate button. To start typing in a particular layout, press the button, check that it’s gone orange, and then start typing. Right justification can look a bit odd in a text (and can be confused with the right-to-left text direction, which would of course use this as standard rather than left justification). However, it is extremely useful if you want to line up a list of numbers or prices so they look lovely and neat. This works in tables and columns of course, too, and makes it so easy to make things look tidy. Centre justification is hardly ever used in anything but a heading, a poem, maybe, or something with a special design like a menu. But if you want to do it, here it is. 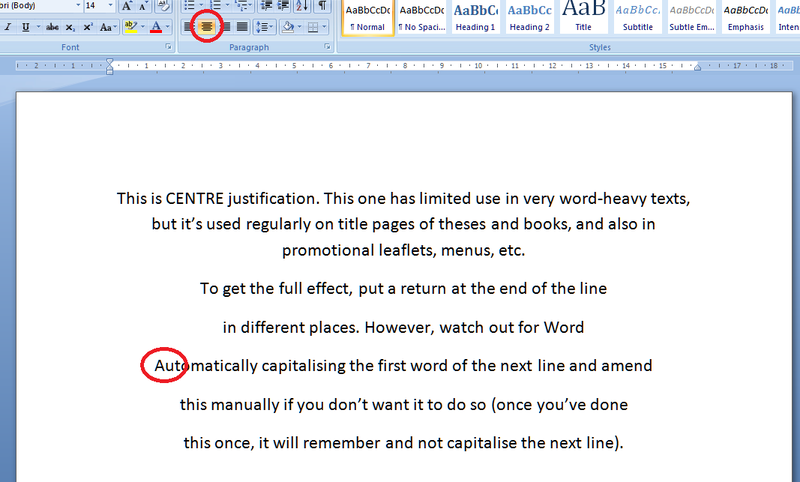 One thing you need to watch out for is that if you hit the enter key to make a new line in order to get the effect or layout that you want, Word will helpfully capitalise the first word on the next line for you (see circled text below). However, at least in Word 2007 and Word 2010, if you change this to lower case once, it will leave it on lower case the next time! Clever Word! We’ve learned in this article about what justification is, the different kinds of justification, their advantages and disadvantages, and when you might want to use them. I hope you’ve learned something useful here! 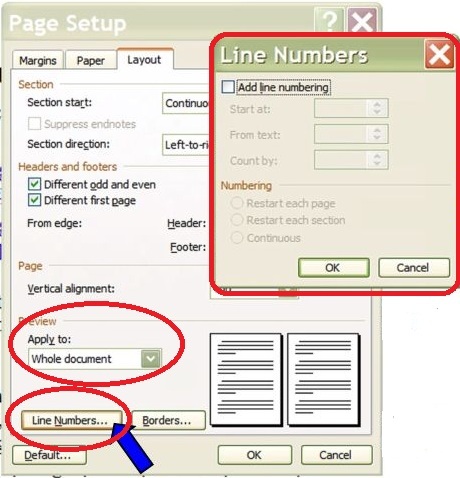 This article explains the correct – and incorrect – way to add line numbers to a Word document. Why would you want to do that? Read on and find out! This works for Word 2007, Word 2010 and Word 2013. Why do I need to add line numbers to a Word document? I was inspired to write this post after my colleague Katharine O’Moore Klopf mentioned that she’d been asked to do this by the editors of a journal for which she was editing an article. Presumably they wanted to be able to refer to particular line numbers in their criticism of the piece. Transcriptions will sometimes have line numbers, if they’re going to be discussed in detail, and we can probably all recall from our dim and distant pasts working on critiques of poems and plays which had 5, 10, 15 etc. in the margins. So these are all reasons for adding line numbers to a Word document. The numbers push the lines across and they run over onto the next line; all possibility of right justification is lost; and heaven help you if you want to insert or delete any text once you’ve done it! Line numbers have automatically appeared, but the formatting of the text, its justification etc., remain as they were. 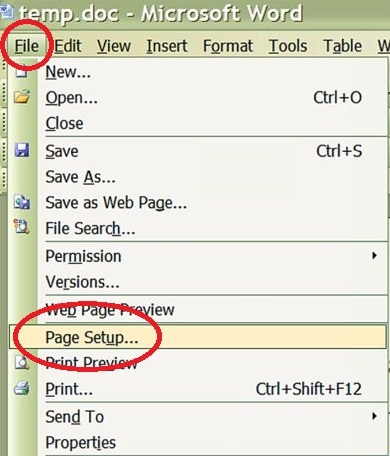 This menu also allows to you to choose whether to restart the numbering at the beginning of each page, or each section, or to suppress the numbering for the particular paragraph your cursor is in. Whatever you choose on here, click OK twice to get out of this dialogue box and the Page Layout one. How do I produce a line number every five or ten lines? You may remember from literature lessons at school that poetry and plays often have every 5th line marked. 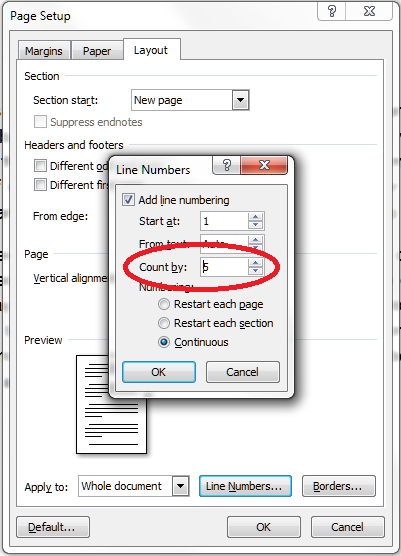 You can do this in Word by choosing that Count by option in the Line Numbering Options menu (see above for how to get to it). 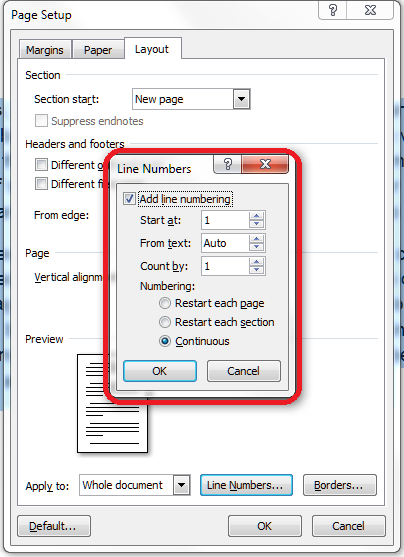 Tick Add line numbering and choose to Restart each page/section and Continuous. Click OK twice to accept – in this dialogue box you also find the options Start at, From text and Count by that are explained above. Thanks to Katharine O’Moore Klopf for the Word 2003 screen shots and instructions. It’s come to my attention (thanks to a commenter on this post) that it’s not possible to copy and paste text with line numbers into a new blank document. This is because the line numbers function actually displays a feature of your document (much like if you turn on paragraph marks) but the line numbers are not a part of the document itself. 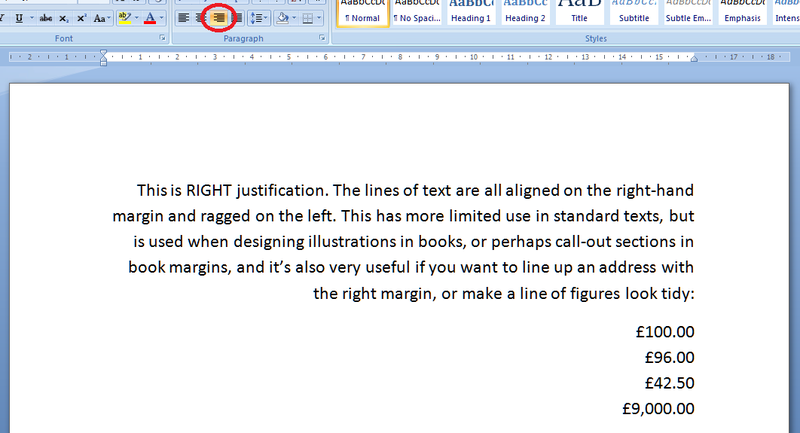 This article has explained why you might want to add line numbers to your document, and how to do it. If you found this useful, please post a comment, share and like this article! Thank you! Please note, these hints work with versions of Microsoft Word currently in use – Word 2003, Word 2007, Word 2010 and Word 2013 all for PC. Mac compatible versions of Word should have similar options. Always save a copy of your document before manipulating it. I bear no responsibility for any pickles you might get yourself into! I don’t often discuss personal matters on this blog, but I wanted to let my readers and subscribers know that I’ve posted about my reaction, as a runner, to the atrocity in Boston yesterday, over on my other blog. I have changed, I have a stronger business mind now. I am well known for giving quality recruitment services and have won one award and have been a finalist for two other awards. I have a member of staff and my own private office in a very nice business centre. I have also stayed the same as a person and still appreciate how hard it can be running a business on your own. My ethical values have stayed the same too. I have learned that there are a lot of people out there that are out for themselves and will try to push their business onto you to get you to spend silly money with them. I wish I hadn’t been taken by other businesses promising you big cash returns if you join their club or business, and taken these people on face value. Research, research, research and ask question after question before you make a decision on anything. Yes, if you believe you can be successful and believe in a decision, then run with it. Good friends and others who are in business will support you. Remember a mistake is only a mistake after the event. Talk to other business people who you network with, tell them if there is a problem, as they may have come across the same problem before. In a year, I will have two more members of staff, making in total a senior recruiter, a general recruiter and a marketing and admin person, allowing me to network more. It’s all very exciting! That all sounds very positive, doesn’t it – sensibly building staff levels, getting a good reputation, and learning from her mistakes (what a shame that quite a few people seem to have learned that particular lesson about researching people and their claims to be able to help – it certainly shows us how careful we need to be.) Chrissie had an eventful year coming up after she posted this update – read more here. 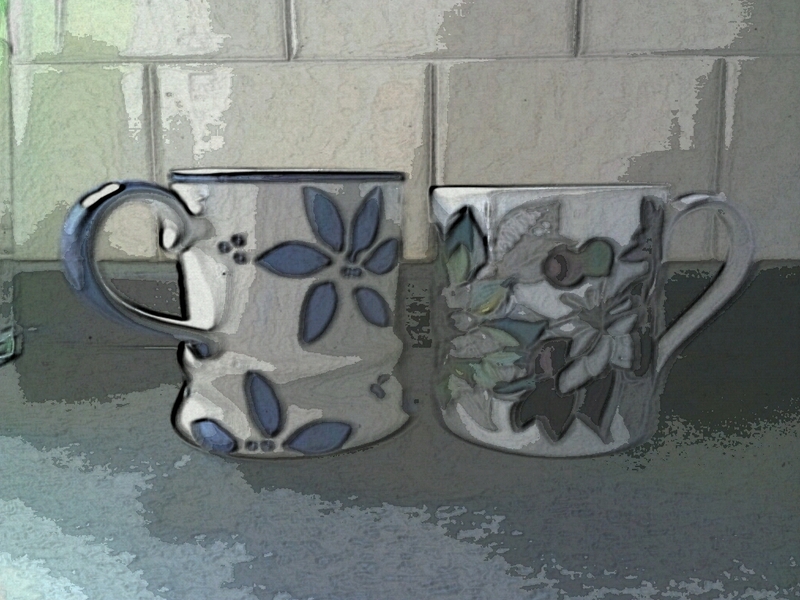 Chrissie’s based in Pontefract and you can find her online at www.chrissiemetcalferecruitment.com. You can email her of course, or phone her on 01977 781595/ 07805 901 562. 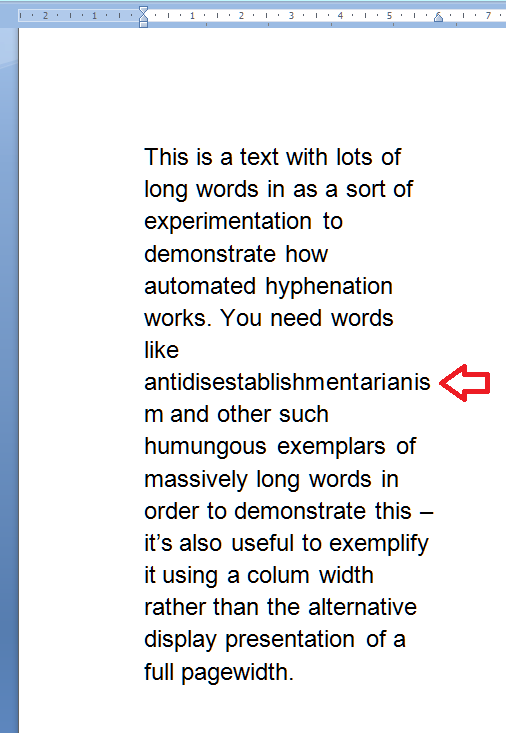 This article explains how to add and remove hyphenation in a Word document, and how to work with the options you have in the hyphenation menu. Why would I want to add hyphens to a document? This issue doesn’t normally come up with standard documents where the text is in a smallish size and extends across the entire width of the page. In fact I hardly ever see it in the work I do, and was only reminded of it when a client had accidentally set automated hyphenation in part of his document that happened to contain long words. Where did all these hyphens come from, I wondered. In fact, as you can see (marked by the arrow), one word is just too long for the line and splits at the last letter, something which doesn’t obey any of the standard rules of hyphenation (I bet this has happened in your tables – it has in my clients’). Oh no! 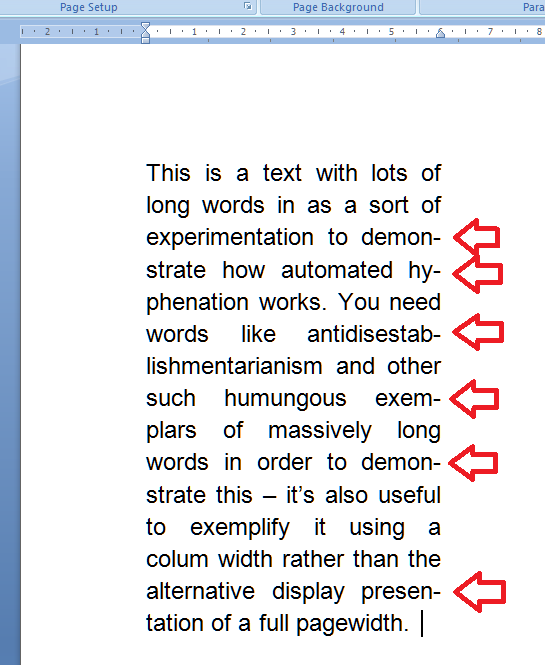 In its effort to make everything tidy, Word has carefully inserted huge spaces between words (unlike someone typesetting properly on a computer or by hand, it doesn’t space out the letters in the words so much as just add massive spaces). And poor old Mr Long Word is still dangling a letter onto the next line. This looks pretty horrible, doesn’t it. Adding automatic or manual hyphenation is the way forward. 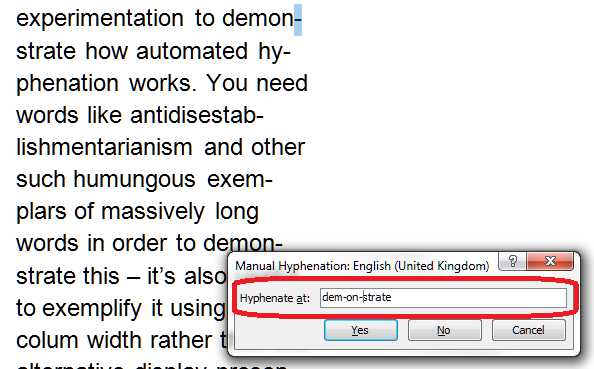 How do I add automatic hyphenation to my Word document? 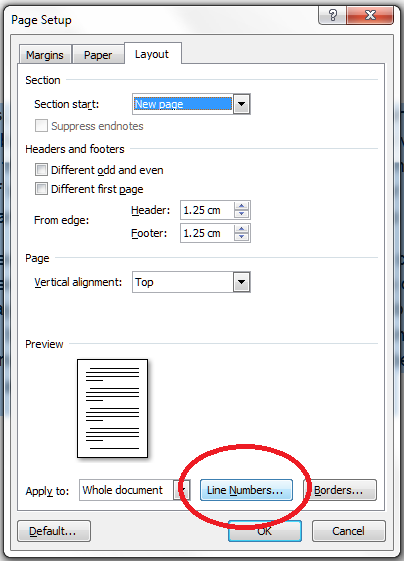 To work with the hyphenation options, we need to be in the Page Layout tab, and the Page Setup area, and there you’ll find Hyphenation (with a little pop-up box explaining it). This is the case in Word 2007 and Word 2010. 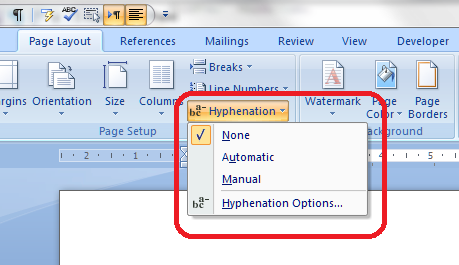 In Word 2003, you need to select the following menus: Tools > Language > Hyphenation. You can choose here between None, Automatic and Manual, and then have some options, too. We’ll look at those options in a moment. 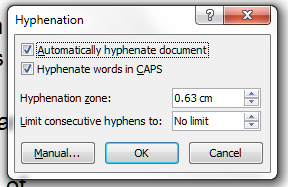 What happens if I add automatic hyphenation to my document? You can see here that Word has hyphenated all of the longer words that previously caused those big gaps, and made the text an awful lot tidier. but I personally think that this still looks a bit messy. 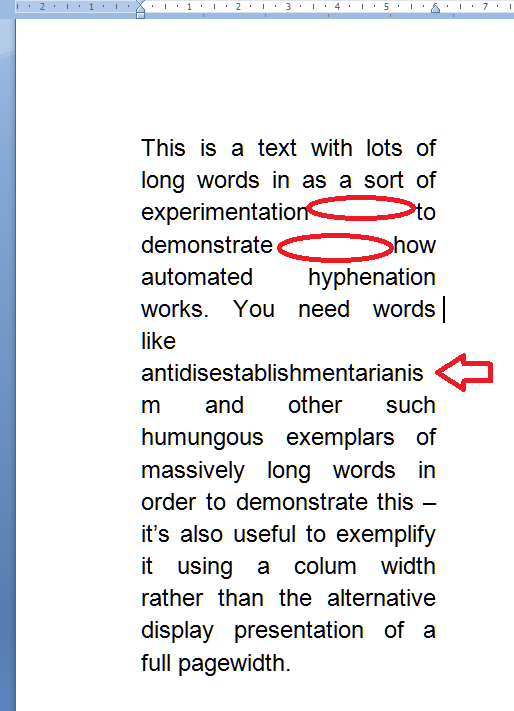 How do I remove automatic hyphenation? All of the automatic hyphenation should disappear. 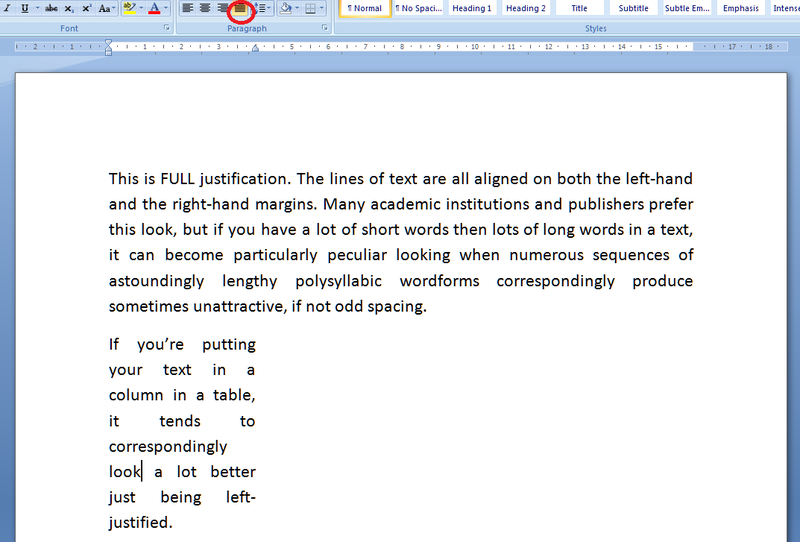 How do I use manual hyphenation in my document? (here we can see our unhyphenated text, with the cursor on “demonstrate”). Once you’ve clicked on Yes or No, it will hop along to the next word that’s a candidate for hyphenation. Why shouldn’t I just hyphenate totally manually? What are the hyphenation options? 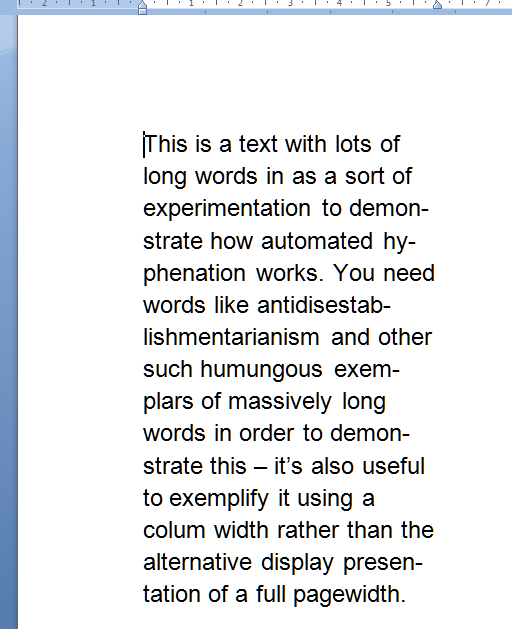 In this article we’ve learned why we might want to apply automatic hyphenation to a document, how we do it, how to remove automatic hyphenation, and the options that are available in the hyphenation menu. This is part of my series on how to avoid time-consuming “short cuts” and use Word in the right way to maximise your time and improve the look of your documents. Do like and share as much as you can, and/or leave me a comment if this article has been useful to you.